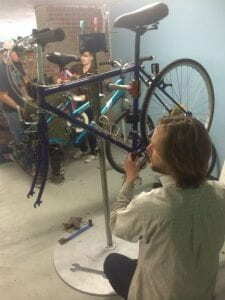 Volunteers at Earn-A-Bike perform a variety of tasks, from bicycle servicing to shop maintenance. Worcester Earn-A-Bike strives to provide bicycles to everyone in the community including individuals who require adaptive bicycles. 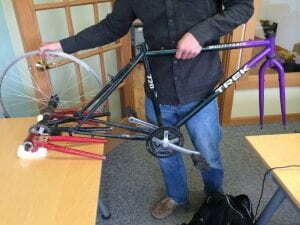 After receiving inquiries about available adaptive bicycles for people with different disabilities, Earn-A-Bike challenged our Interactive Qualifying Project (IQP) team to design and prototype an adaptive bicycle for individuals with Down syndrome, autism spectrum disorder (ASD), and cerebral palsy. Bicycles are a great way to be active while enjoying the outdoors and are one of the most popular forms of exercise, recreation, and transportation throughout the world. While riding a bicycle may seem a simple task for the majority of the population, it can be a challenge for adults and children with cognitive and physical disabilities. Example of an adaptive tricycle used by physical therapists at the Cotting School. For those diagnosed with Down syndrome, autism spectrum disorder, and cerebral palsy, balancing, steering, and pedaling may be particularly difficult obstacles to overcome (Mathias, 2011). When focusing on Down syndrome, autism spectrum disorder, and cerebral palsy, there are unique difficulties associated with bicycling that become apparent. People with Down syndrome may have delayed motor skills and a difference in movement patterns (Ulrich, Burghardt, Lloyd, Tiernan, Hornyak, 2011). Similarly, cerebral palsy affects the development of coordination and posture limiting the activities in which individuals can participate. Symptoms include muscle tone abnormalities, impairment of balance and coordination, decreased strength, and loss of selective motor control (Papavasilou, 2009). Through research and interviewing members of the adaptive bicycle community, including a Special Olympics cycling coach, physical therapists at special education schools, and adaptive bicycle manufacturers, we discovered balancing was the greatest limitation associated with these three disabilities.Although it may be difficult for people with disabilities to ride a bicycle, there are many associated social and physical benefits. Riding a bicycle may improve a person’s self-perception and confidence in social situations. Cycling with family members and friends can help facilitate communication and bonding. Also, cycling is a great form of exercise which helps fight obesity and health concerns. Bicycles can also provide increased mobility as they offer a form of transportation. Lastly, cycling can be a form of physical therapy or rehabilitation, as it can help improve balance and fitness abilities. The numerous benefits to cycling motivate Worcester Earn-A-Bike to provide everyone the opportunity to ride and experience the thrill of bicycling. Cost, availability, and design style are the primary obstacles people with physical and cognitive disabilities face when trying to purchase an adaptive bicycle. Since adaptive bicycles require additional specialized features beyond traditional bicycles, the prices are significantly higher. This large gap in prices between adaptive and traditional bicycles is just one reason alternative bicycles are inaccessible to most people. Availability is another issue with adaptive bicycles since the percentage of people with disabilities who are able to ride and purchase these bicycles is small; only a few specialized companies produce and sell adaptive bicycles. Lastly, many adaptive bicycles have been extensively modified, making them stand out in a crowd, which can be embarrassing to the rider (Lewak, Doree, 2011). Identify appropriate modifications that can be made to existing bicycles to accommodate people with Down syndrome, autism, and cerebral palsy. Create bicycle designs which incorporate the modifications identified in Objective(1). Assess the feasibility of the proposed designs in terms of cost, materials, and fabrication. Prototype the most feasible design. Identify potential sources of funding for Earn-A-Bike. Determine how to educate the Earn-A-Bike community on adaptive bicycles. Earn-A-Bike is a community organization, with most of their volunteers living in surrounding neighborhoods or nearby towns. Therefore, the bicycle we designed would be primarily used for members of the Earn-A-Bike community who desire to ride adaptive bicycles. Conceptualizing the design prototype, which uses readily available bicycle parts from Earn-A-Bike. Our goal was to design a bicycle which is accessible to adults with Down syndrome, autism spectrum disorder, and cerebral palsy. We first had to identify appropriate modifications that could be made to existing bicycles to accommodate the targeted disabilities. We completed this task through research and interviews with members of different cycling communities and organizations, including Special Olympics, Bicycle Man, AmTryke, My Team Triumph, Boston College Campus School, and the Cotting School. We chose these organizations because of their active involvement in providing or working with adaptive bicycles for people with disabilities. We also conducted interviews with families recommended by our sponsors who had personal experiences using adaptive bicycles. Some People with Disabilities Have a Fear of Bicycle Riding. One common theme we found among riders with disabilities and their families that we interviewed was the fear of riding a bicycle induced by a traumatic event. In some instances, the rider had fallen off of a bicycle and consequently lost interest in the activity due to the fear of falling again. Modifying Certain Components of a Bicycle can Make the Bicycle more User-Friendly for People with Cognitive Disabilities. Aside from social and psychological considerations for riders with disabilities, we also found that traditional bicycle height, gearing, and braking systems inhibited riding by people with disabilities. From our interviews, we found that lower seating is preferred so riders can firmly plant their feet on the ground when seated. Limiting the number of gears is beneficial to people with cognitive disabilities, making it simpler for them to select the proper gear for a given situation. Our design limits the amount of gears by only having one gear on the axle and using the existing gears on the front crank of the bicycle. Additionally, our team found that hand brakes are the most effective for people with disabilities. The other types of brakes commonly used on bicycles are coaster brakes, which engage when the rider pedals in reverse. Since our target population has cognitive disabilities, our interviews revealed that the concept of pedaling backwards to stop can be difficult to grasp. Next we created multiple bicycle designs which incorporated the modifications identified through our interviews and assessed the feasibility of each design. These designs included using gyroscopic wheels, a crank forward bicycle frame, an A-frame attachment, or a slim tricycle design. We assessed the feasibility of building these four designs based on the resources available at Earn-A-Bike and the costs associated with building and modifying them. A Slim Tricycle Utilizing Available Parts from Earn-A-Bike was the most Feasible Design. Our IQP team with our finished prototype. Based on our assessments, we determined that the slim tricycle design consisting of a removable rear axle which can be mounted to any traditional bicycle frame is the best approach to creating an adaptive bicycle given the low cost, material availability, and minimal fabrication.The slim tricycle design includes modifying a standard two-wheeled bicycle by removing the rear wheel and adding an axle that can be bolted onto the rear dropouts. Considering the aesthetics of the design, the axle was fabricated to be shorter than most standard tricycle designs. Also, the rear wheels attached to the axle were standard 26” bicycle wheels. This made the design look similar to a standard bicycle when viewed from the side, limiting the degree to which the bicycle stands out in a crowd and embarrassment of the rider. As part of our project deliverables, we will be leaving Earn-A-Bike with our prototype bicycle for use at the shop. Below we discuss our recommendations for the continuing development of adaptive bicycles at Earn-A-Bike. Continue Testing the Adaptive Bicycle Prototype for Safety. We recommend that the design be further tested to ensure it is safe to ride. This prototype should also serve as a base upon which other modifications could be affixed or developed. We believe our bicycle design will be a great resource for the shop to get people with disabilities interested in cycling. Apply to Grants which Provide Funding for Adaptive Bicycle Projects. Additionally, part of our project involved researching potential sources of funding for our bicycle and future projects at Earn-A-Bike. In collaboration with our sponsors, we determined grants would serve as the most viable source of funding for Earn-A-Bike, both because of the variety of grants available and the limitations of crowdfunding. We created a spreadsheet listing grants that focus on non-profit organizations or adaptive bicycles as a resource for EAB to use. The complete list of grants and organizations which we recommend are included in Appendix E.
Specifically, we recommend that Earn-A-Bike consider applying to the Fletcher Foundation, Stoddard Charitable Trust, and Wyman-Gordon Foundation. These grants primarily provide funding for Worcester based non-profit organizations which make significant impacts in the Worcester community. We believe that Earn-A-Bike’s mission to provide adaptive bicycle for people with disabilities and other community members meets the criteria, and recommend they pursue application to these foundations. The front panels of this brochure include information on Earn-A-Bike and the open shop hours, as well as our bicycle prototype. There are also foundations nation-wide which provide funding specifically for bicycle programs and projects. We recommend Earn-A-Bike consider applying to the 7 Hills Foundation, People For Bikes, and the League of American Bicyclists. For example, the League of American Bicyclists provides funding specifically for women-oriented cycling programs, a niche in the Worcester community which Earn-A-Bike fills by offering weekly Women and Trans shop nights. Distribute the Informational Brochures to Educate Community Members on Available Adaptive Bicycles and Programs. Our group also created an informational brochure on adaptive bicycles which includes a number of resources for families. These resources include organizations which develop adaptive bicycles, organizations which sponsor athletic events, and various foundations which provide grants specifically for families in need of an adaptive bicycle. We also included a chart of adaptive bicycles currently on the market for a range of different disabilities, with a description of our bicycle design to serve as an example of what Earn-A-Bike could provide to the community. We recommend Earn-A-Bike distributes these brochures to inform community families on adaptive bicycles and what resources are available. 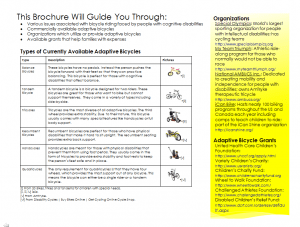 Inside the brochure are examples of available adaptive bicycles, organizations which utilize these bicycles, and grants for families to apply to. 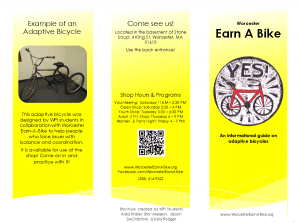 Our group believes that our project successfully provided Worcester Earn-A-Bike the ability to expand their organization to provide bicycles for people with disabilities, meeting their overall goal of providing bicycles for everyone in the Worcester community.